Here at Ferntree Gully Hyundai, we’re not only committed to providing our customers with a fantastic range of New Hyundai Models and Used cars, we’re also committed to delivering great value. The Veloster merges the design appeal of a sport coupe with the versatility of an additional passenger side rear door in an asymmetrical two-plus-one configuration for easier rear-seat access. Live loud with the all-new 2019 Veloster which features a comprehensive exterior and interior redesign, powertrain enhancements, and a bevy of new and improved infotainment and connectivity features. 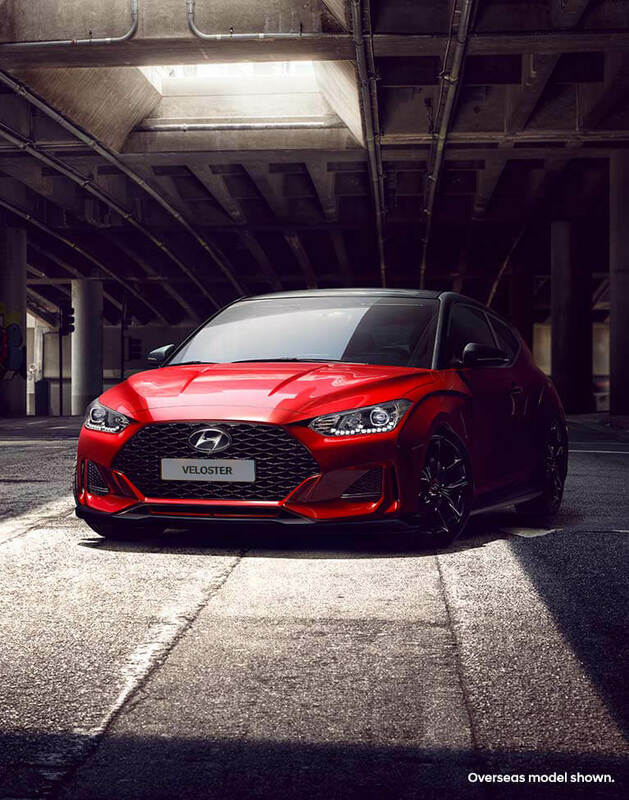 Register your interest today to be the first to know all about the new Veloster, coming soon to a Hyundai dealership near you. Register your interest today to be the first to know all about the new Veloster, coming soon. Mike O’Brien, Vice President of Product, Corporate and Digital Planning at Hyundai Motor America. Imagine knowing the maximum price of your next service, before pulling into the service centre. That’s the advantage of our Lifetime Service Plan* – a clever Hyundai initiative that gives you transparency and peace of mind for the life of your car. No hidden fees and no surprises. Only available at Hyundai Service Centres, you’ll benefit from factory trained technicians using Hyundai Genuine Parts – a smart way to boost the re-sale value of your car. And by taking advantage of the Lifetime Service Plan servicing, you’ll also be eligible for a 12-month extension on your Roadside Support Plan* every year, for up to 10 years. We now also offer a Pre-Paid Service Plan*, with a choice of packages for either 3, 4 or 5 years of scheduled servicing. It’s a great way to lock in today’s service prices. A warranty that goes the distance. It’s a warranty idea we pioneered that gives you the ultimate confidence in your Hyundai – today, and tomorrow. Our 5 Year Unlimited Km Warranty* on passenger vehicles shows the belief we have in the manufacturing, quality control, and design that’s gone into your vehicle. Of course, ongoing care is also a critical part of this. The friendly service staff and expert technicians in our Hyundai Service Centres will happily keep your car in peak condition. Give your Hyundai that personal touch. From roof racks and dash mats, to portable coolers and gear for your gadgets, with Hyundai Genuine Accessories you can mould your new car to your lifestyle. See the full list of accessories for your model. We’re on the road with you. Roadside support for up to 10 years. We’ve all done it. Locked the keys in the car, run out of fuel, left the headlights on. If you find yourself in a bind while you’re on the road, we can get you up and running, free of charge. Your new Hyundai comes with 12 months Hyundai Roadside Support Plan*, available 24 hours a day, every day of the year, right across Australia. Better still, every scheduled service at a Hyundai Service Centre will qualify you for an additional 12 months complimentary Roadside Support, every year for up to 10 years. To ensure we have your correct details for Roadside Support, register at myhyundai.com.au. Help, with a human touch. Sometimes it’s the smallest things. Like how to pair your phone, or where to find your nearest Hyundai dealer. Whatever your question, no matter how big or how small, we’re here to help. From specific vehicle functions and servicing, to booking a test drive or requesting a brochure, our team of Customer Care experts can help you get the most from your Hyundai. You’ll find the answers to many of your questions, ‘tips and tricks’ videos and FAQs at customercare.hyundai.com.au or feel free to get in touch on 1800 186 306. Keeping your software up to date is all part of the package. Our towns and cities are constantly changing. New roads get built; old roads become renamed; and new landmarks pop up. So if you rely on Sat Nav to get around, it’s essential you have the most up-to-date information. Hyundai iCare offers a plan for new vehicles with factory-fitted satellite navigation. Refreshed annually when you service with us, for a period of 5 years or 10 years (depending on model)*. View - iCare terms and conditions. (1) Lifetime Service Plan: For the benefit of Hyundai owners, Hyundai provides online quotes, which specify the maximum price applicable for a vehicle’s next scheduled maintenance service at a participating authorised Hyundai dealer and using Hyundai Genuine Parts (where required). Online quotes are available at www.hyundai.com.au, apply for a stated effective period only and may change after that effective period without notice. Standard scheduled maintenance services are of limited scope. The benefit of online quotes is available for all Hyundai’s, for their lifetime. Hyundai Lifetime Service Plan full terms and conditions. (2) Roadside Support Plan: Complimentary 12 months Roadside Support when you purchase a new Hyundai passenger vehicle (excluding rental buyers & taxis). Further Roadside Support extensions are available, each for 12 months from the date of a scheduled maintenance service at a participating authorised Hyundai dealer (unless vehicle is more than 108 months (9 years) from the original new car sale date, in which case entitlement to Roadside Support ends when vehicle reaches 120 months (10 years) from original new car sale date). Hyundai Roadside Support Plan full terms and conditions. (3) Sat Nav Update Plan: Only applies to new vehicles with factory-fitted satellite navigation. Updates are delivered annually and are complimentary if the vehicle completes a scheduled service at a participating Hyundai dealer. For i30 (2017 model onwards), updates must be undertaken within 10 years of the vehicle’s initial purchase, maximum number of 9 updates. For all other Hyundai’s updates must be undertaken within 5 years of the vehicle’s initial purchase, maximum number of 4 updates. application” as defined in the vehicle warranty policy, for which a 5 year/130,000km (whichever occurs first) warranty applies. An iMax that is used for a commercial application is provided with a 5 year/160,000km warranty (whichever occurs first). An iLoad is provided with a 5 year/160,000km warranty (whichever occurs first) regardless of its usage. Refer to full warranty terms and conditions for details and exclusions. (5) Pre-Paid Service Plan: For scheduled services only, including parts. Does not include wear and tear items: eg, brake pads. Hyundai Pre-Paid Service Plan full terms and conditions. (6) Genuine Parts & Approved Parts Warranty: For 12 months from the date of purchase of the Hyundai Genuine Part or Hyundai Approved Part from an authorised Hyundai dealer or authorised Hyundai service outlet (Warranty Period), Hyundai warrants that the Hyundai Genuine Part or Hyundai Approved Part will be free from defects arising in workmanship or materials, subject to the conditions outlined under “General Exceptions”. If any Hyundai Genuine Part or Hyundai Approved Part is found to be defective in workmanship or materials within the Warranty Period, it will be repaired or replaced free of charge, or at the discretion of Hyundai the purchase price of the Hyundai Genuine Part or Hyundai Approved Part will be refunded. Hyundai Genuine Parts & Approved Parts Warranty full terms and conditions. (7) Genuine Accessories Warranty: For Hyundai Genuine Accessories fitted to the Hyundai vehicle by an authorised Hyundai dealer or authorised Hyundai service outlet during the Hyundai vehicle’s warranty period (as determined by Hyundai in accordance with the Hyundai vehicle service passport), the applicable warranty period is the longer of the following: i. period commencing from the date of fitment of the Hyundai Genuine Accessory until expiry of the relevant Hyundai vehicle’s warranty period; or ii. period of 12 months from the date of fitment of the Hyundai Genuine Accessory. Hyundai Genuine Accessories Warranty full terms and conditions.